MEATLOAF... Like a Bat Out of Hell! Sorry wrong meatloaf! 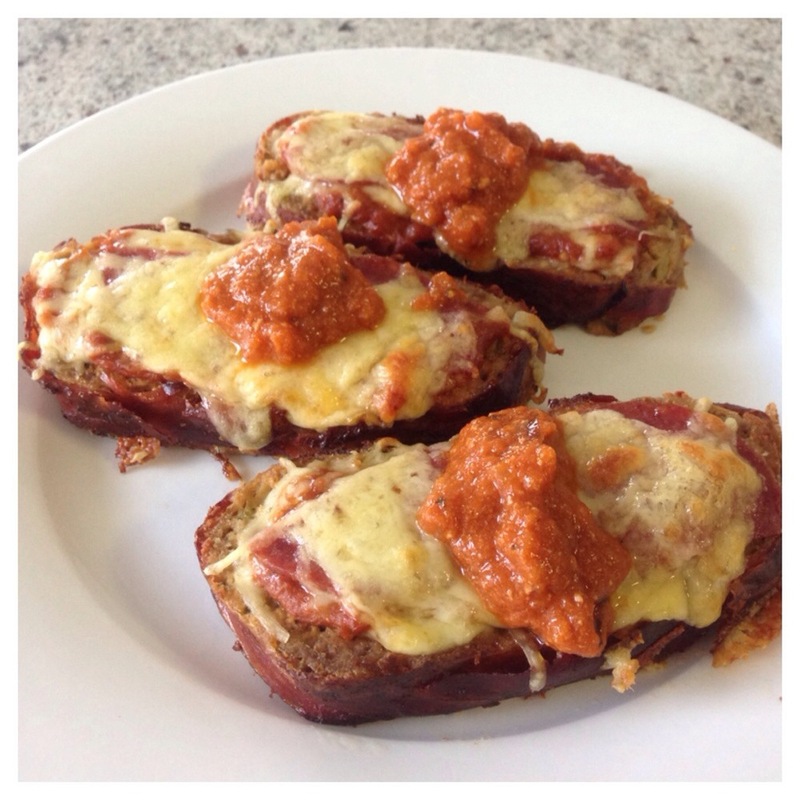 :) Last night for dinner I made my Meatloaf Pepperoni Mini Pizzas and they were a hit. I thought I'd better not keep these little gems to myself. I started by slowly caramelising two brown onions in butter, olive oil and garlic. Then set that aside to cool. Next I grated one large zucchini and lined a loaf tin with slices of prosciutto. In a large bowl I combined half the onion mix, zucchini, 3/4 cup of almond meal, 500gm beef mince, 500gm pork mince, two eggs, mixed herbs, black pepper, smoked paprika, onion & garlic powder. You've got to use your hands for this btw :) That's what makes it fun! Place mixed mince mix into the loaf tin and fold prosciutto over the top. Bake in 180°C oven for 1.5hrs. Half way through cooking you may need to carefully drain off excess liquid to ensure a nice browned loaf. I added this liquid to sauce mix. For the sauce I took the remaining onion, one can of unsweetened chopped tomatoes, a splash of balsamic vinegar and black pepper. Simmered gently and reduced. I then added the pan juices and blitzed with a stick blender. Once the meatloaf has cooked I set it aside to cool. This could easily be done the day before. Once everyone was ready for dinner I sliced the meatloaf into 3/4inch slices. Topped with a spoon of sauce, some mozzarella cheese, two slices of pepperoni and more cheese. I then baked these little beauties for 12mins in a 200°C oven until golden and YUM! Top with a lil more sauce and serve! Simple, delicious and very satisfying!